Our own Charity Martin will be facilitating a new group beginning next Monday Evening, and we want to make certain you don’t miss the opportunity to participate. This is a great way to build resources and trust in coming home to our felt experience. It helps to build allegiance and confidence in relaxation, in opening to our experience without judgement, and in discovering how to be kinder, more genuine, open, and present. I met Charity at a workshop entitled “The Power of Embodied Presence,” led by John Welwood, with whom she has studied for years. I was inspired by the idea of attuning to my own being and presence through experiencing feelings and sensations in my body. I wanted to reconnect my mind and body through my heart, and to strengthen my intuition. I practiced this mode of awareness with Charity for six months through weekly sessions. She is a strong, reliable and gentle facilitator of this very intimate search for greater openness and access to the loving core of ones being. I always left her practice room feeling slowed down, more alive, and more awake. I continue to practice the approach on my own, and find it a treasure of immeasurable value. I’m excited about the group starting. It’s luxurious to take the time to go deep into experience. I’m looking forward to Charity’s guidance and the sweet intimacy that can occur when people share from a grounded place. Please spread the word to anyone who might benefit. 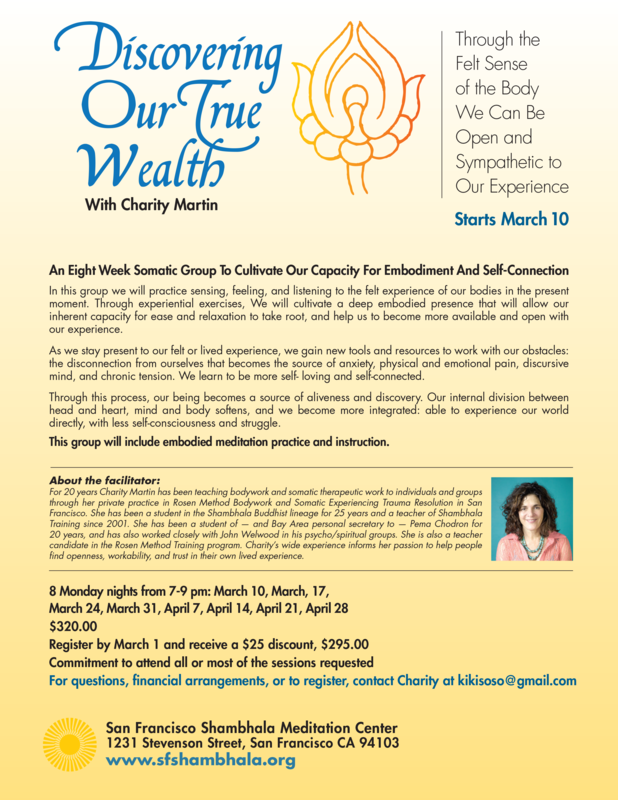 An eight-week somatic group to cultivate our capacity for embodiment and self-connection. In this group we will practice sensing, feeling, and listening to the felt experience of our bodies in the present moment. Through experiential exercises, We will cultivate a deep embodied presence that will allow our inherent capacity for ease and relaxation to take root, and help us to become more available and open with our experience. As we stay present to our felt or lived experience, we gain new tools and resources to work with our obstacles: the disconnection from ourselves that becomes the source of anxiety, physical and emotional pain, discursive mind, and chronic tension. We learn to be more self- loving and self-connected. Through this process, our being becomes a source of aliveness and discovery. Our internal division between head and heart, mind and body softens, and we become more integrated: able to experience our world directly, with less self-consciousness and struggle. 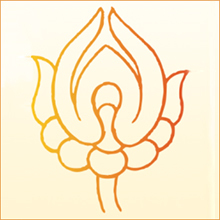 This group will include embodied meditation practice and instruction. For 20 years Charity Martin has been teaching bodywork and somatic therapeutic work to individuals and groups through her private practice in Rosen Method Bodywork and Somatic Experiencing Trauma Resolution in San Francisco. She has been a student in the Shambhala Buddhist lineage for 25 years and a teacher of Shambhala Training since 2001. She has been a student of, and Bay Area personal secretary to, Pema Chödrön for 20 years. Charity has worked closely with John Welwood in his psycho/spiritual groups. She is also a teacher candidate in the Rosen Method Training program. Charity’s wide experience informs her passion to help people find openness, workability, and trust in their own lived experience. Commitment to attend all or most of the sessions requested. Please note that this is not a San Francisco Shambhala Program, so membership discounts and SF generosity policy do not apply.